The revolutionary Pro Taper tie-down incorporates a spring loaded, swivel carabiner base hook that will prevent your straps from ever getting twisted or coming un-hooked in hard to reach places. 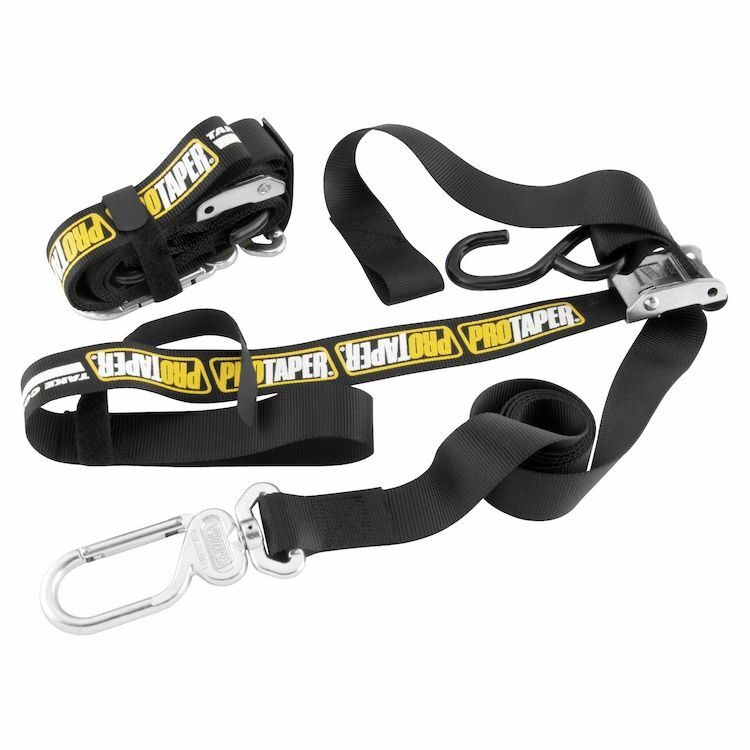 This tie-down system is far from your traditional strap set up and has received rave reviews since being introduced. It’s so much easier to have the straps built into the tie downs. No complaints they look and work awesome, I love how the tie down end is a full locking carabiner instead of just a hook, really helps when you are loading up the bikes alone so the hook doesn't fall off the trailer while you are hooking onto your bike. These tie-downs are great. They are high quality and well designed to secure your bike, without the hassle of generic ratchet straps. The carabiner end clips onto the bed anchors. You do not have to worry about them coming off, like standard ones. They also have a built-in swivel that reduces annoying twists in the strap. The "soft handlebar straps" are also very nice, allowing you to secure from the bars without scuffing them, or it allows for securing around the lower fork brace(my preferred method). They are not overly long, leaving you with a ton of extra strap to deal with. And they have a velcro strap that can be used to tidy up the loose end, or wrap up the whole strap when not in use. Very nice feature, I can stop using zip ties now. I wish I bought these a long time ago. I have better peace of mind while ripping down the highway using these straps. They have streamlined the task of securing my bikes, and increased safety. Win-win! If you are on the fence, just buy them, you will be glad you did. These are the best tie downs I've seen on the market. They work great for my three unit dirt bike trailer.